Recent news cycles remind us of the ignorance surrounding concrete durability, life cycle performance, and perceived connection to global warming tied to carbon dioxide emissions in portland cement production. A May CNN Style post, “Can the building industry break its addiction to concrete?,” credits concrete with defining construction in recent centuries, then sharply digresses: “But do we need to re-evaluate our concrete habit for our sakes and the planet’s? Production of cement is disastrous for our biosphere, while the degradation of many concrete buildings has some experts predicting a colossal headache in the future.” Author Thomas Page follows that aggressive take with minimal examination of concrete structures’ role in quality of life basics—from water supply and wastewater conveyance and treatment, to transportation infrastructure, to a built environment known for withstanding exposure to fire and nature’s forces. Exploring load-worthy alternatives to concrete with materials and design experts, he points to a California building’s 24-in. thick, rammed-earth walls. As author of The World in a Grain: The Story of Sand and How It Transformed Civilization (Penguin Books, August 2018), Beiser appreciates concrete buildings’ role in stepped up urbanization the world over. He cites a United Nations estimate of 65 million people locating to cities annually, but trivializes the near-permanent nature of a concrete slab or elevated slab structure bearing on properly engineered foundations. For a look at construction light on concrete, Beiser should check local media reports on a February 2018 fire at the three-story, wood-framed Corsica Apartment Homes near Los Angeles. It is among dozens of Build With Strength-spotlighted incidents involving existing or new wood construction. Weeks after “Can the building industry break its addiction to concrete?,” the Cable News Network balanced its coverage. A CNN Money segment focused on the carbon-sequestering properties of concrete structures cast from mixes using the CarbonCure Technologies process. It discovered how carbon dioxide imparts performance in fresh and finished slabs and structures in a visit with lead CarbonCure user, Atlanta-based Thomas Concrete. The segment, “This concrete traps CO2 emissions forever,” is a good reference to journalists seeking a pertinent angle on concrete. 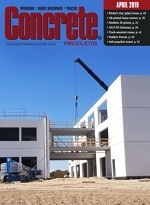 Thomas Concrete and Build With Strength coalition members are among many authoritative sources with insight on probing questions like: Is there a viable alternative to concrete on the horizon? Is the negligible CO2 load associated with portland cement-based products a good trade off for the superior life cycle attributes certain in properly designed, placed and finished slabs, structures and enclosure elements?